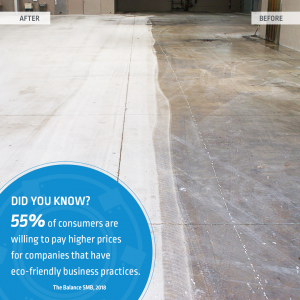 When it comes to commercial cleaning and renovation, there are numerous ways everyone can benefit from a more thoughtful, eco-friendly approach to every job. By taking simple steps and a little extra care, you can save money, help the planet, and be able to boast to customers, friends and family about being green. Many home and business construction renovations discard tons of usable material, sending it directly to landfills. So rather than smashing up perfectly reusable kitchen cabinets, tubs, toilets and more, you should consider donating them to charitable organizations such as Habitat for Humanity. The proceeds this wonderful organization earns from the sale of these materials are used to fund the construction of low-income housing projects in your community. 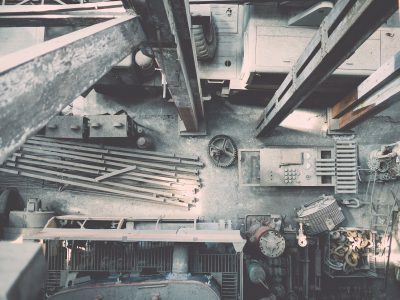 So whether you are a contractor or simply hiring one for a renovation job, you should consider how any usable materials can be salvaged and donated. Over two million tons of E-waste are discarded every year in the U.S., of which only 27 percent is recycled.1 The balance ends up in landfills, incinerated, or illegally exported to developing countries. If you are getting rid of electronics that are less than five years old, they can likely be donated to schools or charities in your area. Likewise, eBay for Charity allows listing of used items, with the proceeds going to nonprofits or charities. Another option to consider is the technology recycling programs some manufacturers and retailers offer, such as Dell, HP, Best Buy, and Staples. You’ll get cash or credit for trade-ins. No matter how you dispose of any electronics, be sure to erase all important information first. Water shortages are in the news more than ever. For example, California has been enduring drought conditions since 2011. As a result, many areas have enacted very stringent water rationing. But even if you aren’t in one of these areas, reducing water use is a great way to save money and help conserve a valuable resource. Simply by maintaining plumbing and installing low-flow toilets and faucet aerators in your washrooms, you can make a huge difference. If you don’t already have low-flow toilets, you can put one or two plastic containers filled with pebbles in the reservoir tank of your toilet. If your business has landscaping, consider a drought-tolerant landscape design and a drip system with rain sensors. For cleaning jobs, consider a high-efficiency pressure washer to save time, money, and water. Recycling is one of the most common and effective ways to help the environment. When you instate a recycling program for all the paper, plastic, and cans in your business, you will not only be more green, but improve employee morale. Make sure to place plenty of recycling bins in the office, so employees can easily access them. Also consider adding a compost bin to your break room so employees can throw away organic food scraps. That way you reduce your company carbon footprint and add less to local waste facilities. To cut down on paper waste, unsubscribe from junk mail lists and update your in-house mailing lists. Consider focusing on email advertising versus direct mail or flyers. By adding hand dryers to your bathrooms, you reduce paper towel waste. Indoor air pollution is one of the top five environmental health risks. Interior air can be contaminated with toxic chemicals from furniture, carpeting, and paint, so bringing plants into your office can help improve air quality and promote a stress-free space. There are many safe and effective alternatives to harsh cleaning chemicals. 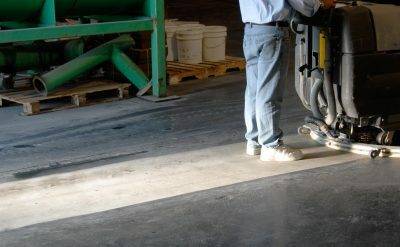 For instance, Diamabrush tools clean commercial or industrial concrete and terrazzo with no chemicals at all. Get in contact with us to learn how you can go green using Diamabrush, while giving your floors the TLC they deserve.